Let’s explore Segesta & Erice together, local friendly staff and comfortable vehicles at your disposal. At about an hour’s drive from Palermo, Segesta’ s origins are placed somewhere between legend and history. The inhabitants of this ancient town were responsible for the extension of the Peloponnesian Wars into Sicily when the Athenians went up against Siracusa. Archeologists are still doing digs here, so there’s always something new to discover. 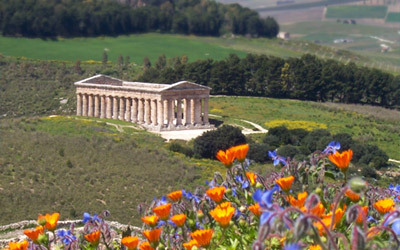 Segesta is one of the most spectacular and ever-growing archeological sites of Sicily. It was founded by the Elymians, refugees from ancient Troy, before the arrival of the Greeks in Sicily. After another spectacular drive, we will reach the hill town of Erice. Again myth and history merge together at this site where for centuries people worshipped the goddess of love, offering her the ultimate sacrifice. We will visit the massive Doric-style Temple from the 5th century B.C. and the ancient Theater: both are on two separate hills. The views from the hilltops are fabulous and the surrounding countryside is mostly cultivated with vineyards. Spectacular drive to Eryx. Although Erice was founded during ancient times, today it is a medieval town over-looking the sea at the most north-western end of Sicily. 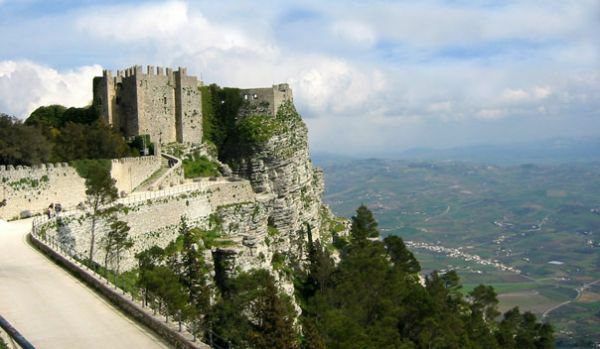 Its cobblestone streets give Erice a pleasant medieval atmosphere and the town boasts a breath-taking view near the 12th century Norman Castle which is surrounded by a lovely park. From here you can also see the western coastline dotted with many salt flats. The town is famous for its delicious almond cookies and marzipan. Lovely ceramics and colorful rag rugs are also in the town.